When you joined or registered an affiliate program, you can catch the affiliate link from this affiliate program and promote its products or services by using your affiliate link. affiliate links) will know that you are their affiliate and referred the customers to buy their affiliate products from your website. This affiliate link can track all the purchase process, and if someone buy products via your affiliate link, you will earn affiliate commissions automatically. Affiliate link is a special URL that contains your unique affiliate ID and username. All affiliate programs have an independent part ( maybe some are in different places) where you can get your affiliate link and other affiliate promo materials ( such as banners…). 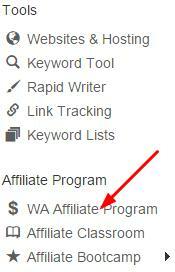 At the end of the affiliate link, you will see “?a_aid=32b2b126” followed the WA domain name. This special part is your WA unique ID and allow WA affiliate program track your sales and pay commissions for you if your sale is completed. Other affiliate programs have such similar link that can add to your website. Someone said, your affiliate link would be stolen by others. This is completely wrong. Nobody can steal it. Don’t care about this. Sometimes I use free pretty link WordPress plugin to cloak or mask my affiliate links just because some visitors wouldn’t like to click some long or ugly affiliate links. How do you feel above affiliate link? If the author didn’t explain it, you don’t know what it is about at all! It’s a clear and meaning URL and your website domain can also be spread in this way. This is a free plugin. If you have your own WordPress website, you can add this in your plugin area. Generally, adding your affiliate link by using hypertext link. This is very friendly to search engines and the process is very easy. Another good of this is: your original long affiliate link will be hidden under the text if you don’t use Pretty Link Plugin. Click “Add Link” and all works are done and your affiliate link is added successfully. Finally, don’t forget to update or re-publish your post to be sure that your affiliate links works well. Now you can earn credits or affiliate commissions through your affiliate links. If you have any problem, please leave your comments below, I will answer them ASAP.